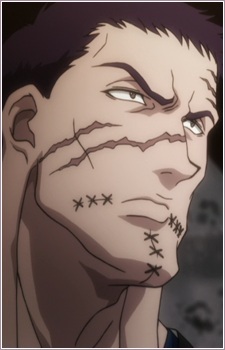 A hulking, Frankensteinian monster is what Franklin (Furankurin) appears to be, complete with scars and sewn-up wounds that ravage his face. It does seem though, that beneath his harsh exterior lies a small, caring spot in his character, as Franklin acts as a care-giver to Shizuku, and shows concern of her well-being. He is also composed and respectful, normally breaking up arguments and fights within the organisation. He is one of the Genei Ryodan that originated from Ryūseigai. Nen Ability - Double Machine Gun: Franklin is a human machine gun, as his fingers cap off to reveal chambers where he channels his nen that shoot out as bullets. His fingers weren't required to be cut off and used as caps in order to achieve this, but Franklin did so because he felt "it would be more effective." Doing this actually did greatly enhance the force of his Nen Bullets, due to the commitment he showed in doing so. This power has been shown to wipe out a room full of people within seconds. The Phantom Troupe is a world famous gang of thieves in the Hunter x Hunter series. Get to know more of this notorious gang and its members below!